Place spaghetti in a large pot full of boiling water. Turn down heat and allow to simmer for 10-15 minutes until pasta is tender. Heat a large pot to medium heat. Add oil. Then add crushed garlic and onions, stirring until soft. Then add tomatoes, tomato puree, canned tomatoes, salt and basil. Mix together. Simmer over a medium heat for 5 - 10 minutes until tomatoes are soft and set aside. Place a third pan on a medium heat, add the minced beef and keep stirring until brown all over. Drain the mince. Return to the pan and add in peppers and chilli /chilli powder / chilli flakes. Add tomato based sauce to the pan and simmer until peppers are soft. Remove spaghetti from heat and drain. 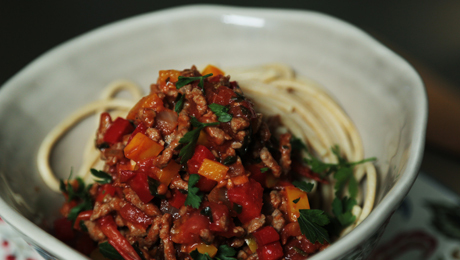 Place spaghetti on serving plate and ladle over the mince mixture.